“We are living in a world in which the majority of parliamentary democracies are based on constitutions that guarantee the rights and freedoms of all citizens, but where governments favor above all the economic interests of big business and the wealthy. “Political life in public discusses the problems that affect the entire citizenry, but in the shadows, legislation plots to favor the interests of financial capital and big business. The result is that the governments we have elected to oversee our wellbeing are now willing accomplices to a process that favors the enrichment of a small group at the expense of the majority and thereby gives rise to an increasingly unjust society. 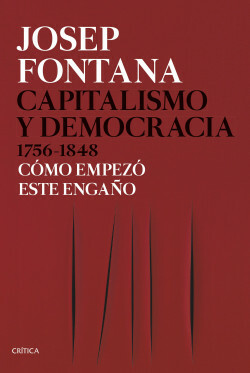 This is the opening of the posthumously published book by Josep Fontana, in which he attempts to explain in a very clear way what the capitalist system is today and how its power has always favored its own development at the expense of general wellbeing. This evolution has been based above all in laying claim to the earth and to natural resources once held in common and in liquidating the achievements of collective bargaining to submit workers to new rules that permit the appropriation of the better part of their salaries. It is a brief history of Europe at a key moment in the birth of capitalism.